F-150 XLT Crew 4x4....One owner truck that has been VERY well cared for for all of its 83,000kms. Rear rotors and brake pads were replaced with new in March 2019. Front rotors and brake pads were replaced with new in August 2018. This truck has a 2' front 'Rough Country' lifted struts (not a spacer lift). 1' rear block lift with 'Rough Country' shocks. The Cam phasers and Timing Chains were done under factory warranty in March 2019. Oil has been changed every 5,000kms with Synthetic. Air filter has been changed every six months. Spark plugs changed out at 60,000kms with the new updated Ford #. - This is one nice used truck! INTERNET MARKET VALUE PRICING at Harris Oceanside Chevrolet Buick GMC in Parksville. Our Internet market value pricing is achieved by polling third party web sites on a daily basis. This insures ALL of our customers receive a REAL TIME market value price. We feel a vehicle's value is determined by its demand and availability, not by what we paid for it. or how long we have owned it. Therefore, we DO NOT inflate our pre-owned prices in hopes of winning a negotiation contest. In addition, every pre-owned vehicle comes with a free Carproof Report. Check out our pre-owned inventory or contact us with any question. 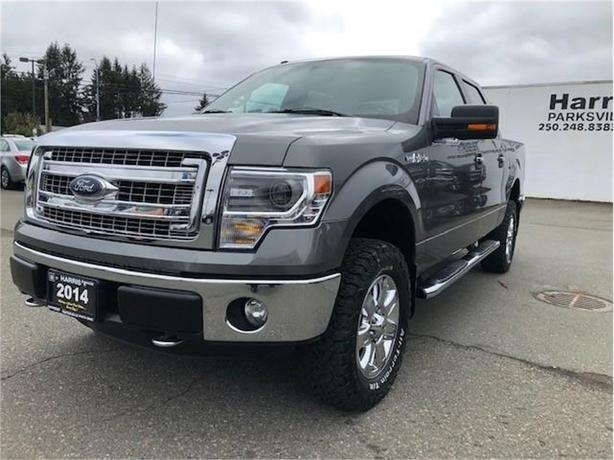 Ford F150 XLT for sale at a dealership near Parksville Qualicum Beach.